"The private sector simply isn't stepping up to confront this challenge." "Imagine a country of 125 million people, the eleventh most populous nation in the world. This is like no other country we know: its citizens are without employment or shelter and do not have the means to feed themselves or provide for their loved ones. This is the number of people in the world who need humanitarian assistance, mostly as a result of conflicts but also because of natural disasters. But we are falling short in providing the funds that are needed." This is the stark warning issued by the UN secretary-general's High Level Panel On Humanitarian Financing, which launched its final report, Too Important to Fail, in Dubai a few weeks ago. The report explains that because of a number of factors – including changes to the nature and length of humanitarian crises – the world's humanitarian system is underfunded and unsustainable. This is underscored by the fact that even though the UN raised more for humanitarian assistance in 2014 than any previous year on record, it still had the biggest ever shortfall in humanitarian funding over the same period. Now, I must admit that until recently I hadn't given this issue the thought it deserves. Like many in the private sector, I saw little connection between the humanitarian aid system and business, with the exception of corporate charitable donations. I'm not suggesting the business sector is dismissive of human suffering. Far from it. But when natural disasters or conflicts occur, we tend to look to this amorphous device called "the international community" to come to the rescue. I've come to learn that it isn't that simple. The truth is that communities in crisis lead to vulnerable societies. And vulnerable societies are prone to all kinds of social and economic degradation, including the rise of hopelessness, extremism and instability. Rarely do these problems stay contained. They spill out, and they metastasize, injecting their poison into the global system. In the Middle East and North Africa there are obvious examples of this deadly domino effect, many of which are unresolved to this day. This isn't of course just bad news for governments and societies. It is also bad news for businesses everywhere. The private sector simply isn't stepping up to confront this challenge. In 2014, only 4.8% of global humanitarian appeals were met by businesses. However, before we judge ourselves too harshly, it is worth thinking about why that might be. 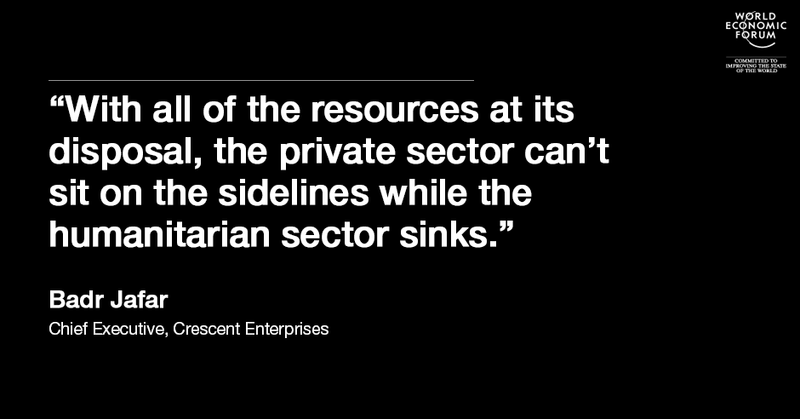 Why is it that the private sector is not a more active participant in addressing the world's humanitarian needs? Digging into this issue uncovers a number of factors that keep getting in the way. First, there is the changing nature of humanitarian crises. Not long ago, the cost of responding to humanitarian crises was roughly split 50/50 between natural disasters and human conflict situations. Today, 80% of humanitarian needs are caused by conflict, with most being recurrent or protracted crises lasting seven years or more. These are invariably complex political situations that businesses naturally tend to avoid. That explains why appeals for hurricanes and earthquakes can mobilize the business community in ways that the crisis in Syria has, to date, failed to do. There's no easy fix, but the issue could be partly alleviated through greater consultation between businesses and their own governments, for informed guidance on the best ways to contribute. A second obstacle is the trust deficit that has emerged between key private sector and humanitarian stakeholders. This is partly due to businesses being made to feel only as important as their chequebooks, and is exacerbated by perceptions of waste and inefficiency in the international aid sector as a whole. The more we can rebuild that trust, the more collaboration will occur. In fact, one of the key recommendations of the High Level Panel is a "grand bargain" in which humanitarian organizations commit to more transparency, accountability and communication, and in turn major donors provide more long-term funding without unnecessarily onerous restrictions or earmarking. Then there is the absence of a clear entry point. Even if businesses want to donate funds, or partner with humanitarian organizations, it is not always clear how to do so and with whom they should connect. The intense competition between aid agencies for limited resources exacerbates this problem. What's needed is a universal hub for businesses to plug into the humanitarian ecosystem and understand how they can best contribute, not just with their financial resources but also their products, services, networks and capacity to scale. The Connecting Business initiative launched by three UN agencies at the World Economic Forum’s Annual Meeting in Davos is an important step forward in this regard. Huge potential also exists for a dedicated initiative targeting small and medium enterprises. SMEs make up more than 90% of companies and generate over 50% of total employment worldwide. They are often small and nimble, trusted by local communities, and are present in most humanitarian disaster zones. However, few formal mechanisms exist to coordinate their involvement in disaster prevention, preparedness and response operations. As a result, one of the largest and most widespread sources of private sector energy and goodwill is going untapped. This must change. Finally, we have to accept that the business case for private sector humanitarianism has rarely, if ever, been clearly articulated. Historically, donations have gone into the system, money has been spent, and for a lot of private donors the benefits have been unquantifiable. That's why we need to move our mindset from donating to people in need, to investing in the resilience of communities. And to do that, we need credible case studies to demonstrate the negative impact on businesses from instability and crisis versus the measurable benefits of resilience. In the new Sustainable Development Goals unveiled late last year, the global community declared with great fanfare that it would "leave no one behind". Well as things stand today, we are failing to live up to that promise. Worse still, the ones we are leaving behind are some of the most vulnerable children, women and men of all. With all of the resources at its disposal, the private sector cannot sit on the sidelines while the humanitarian sector sinks. It is in our enlightened self-interest for business to start making a more meaningful and authentic contribution to the resilience of our most fragile communities.